This time around, I have the pleasure of featuring a young up-and-coming artist who also happens to be a fellow Swattie (class of 2012)! Although our times at Swarthmore don't overlap, I have been following her artistic exploits for about a year with great enthusiasm. 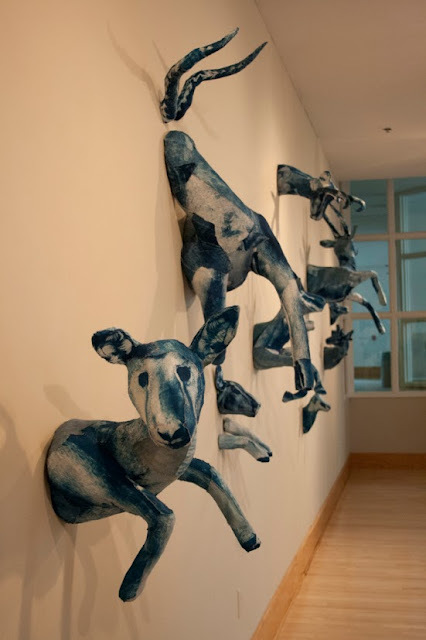 Tasha Lewis (whose website is located here) is an incredibly creative and talented artist who specializes in cyanotype sculptures of animals, usually in shades of blue (though she has recently expanded to using other colors). 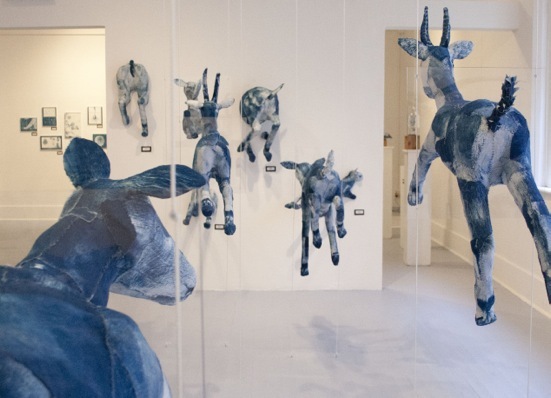 Her artwork is not content merely to rest on perches in galleries. Carefully made antelopes and deer burst forth from the walls; swarms of butterflies flock to fences and to windows. 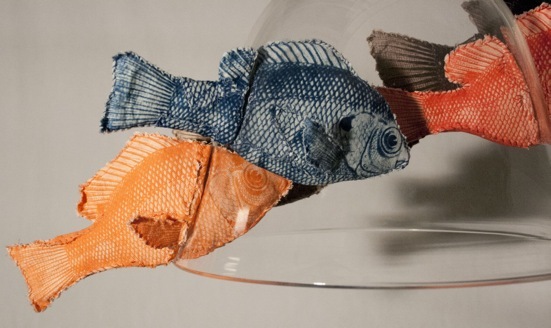 Birds, fish, and reptiles emerge in and out of glass jars, keenly held together with magnets. Indoors, outdoors: each space she touches, for however brief a time, is totally transformed as she plays with the constructs of the artificial and natural worlds, blurring the borders between the two. Based currently in New Jersey, Tasha has exhibited several times at Swarthmore College, in her hometown of Indianapolis, as well as at locations all over the east coast, including Philadelphia and New York. In addition to her sculpture, Tasha also creates book art, makes prints, and does graphic and web design. Her works are unique and unlike anything I've ever seen, making her an artist to watch in the future. Tasha Lewis: I started making art as a kid; it was always a part of my life. Once I got older, I focused on photography and eventually convinced my parents to set up a darkroom on our basement. In high school I experimented with different print methods in the darkroom, and kept trying to push the photographs to rely more on my hand than a mechanical process (with few successes). The summer before my senior year I attended an Alternative processes photography camp in Maine and it totally changed the way I thought about the photograph. I came back with knowledge of 6-7 new processes and started to use them in 2-D mixed-media work. Once I got to Swarthmore I took all sorts of art classes. I found that printmaking and photography are basically the same thing, and I continued to created mixed media works with my growing arsenal of skills. I took ceramics and really enjoyed the feel of that. When I was abroad I studied lithography. I entered senior year after having spent the final month summer TA-ing for the same alternative photography camp I had attended, and was working with fabric cyanotypes. I realized that I wanted to make sculptures and cover them with these photographic skins. I have been working through that idea for the past two years, and there are still new places to explore. TL: Newspaper, masking tape, cardboard, wood, wire, thread, cyanotype cloth, and magnets. I call it "cyanotype sculpture". TL: I am inspired by contemporary and past artists, but I find that my best thoughts come from cross pollination with other disciplines. Literature inspires me, my friends and what they do, art blogs, science blogs, engineering blogs— they all add small pieces of thoughts into a balance, and one day one of those totally disparate ideas will add the final chunk and I will have a new idea. I would say that I work hard on a daily basis in my practice, and with that comes new ideas and new projects. It is that work, and the world I absorb while doing it, which inspires me more than any one painting or person. IOtA: What was your experience like as a Swarthmore artist? TL: I had an amazing time at Swarthmore. The Art and Art History Department is such a great family to be a part of, and I had a wonderful cohort of Senior Majors to share the experience with. IOtA: When did you decide to start creating site-specific pieces? TL: To me, addressing the whole room or environment is just an extension of working in sculpture; it was a natural progression for me. Sculpture forces you to think about the object in space and naturally you start to think about how the specifics of that space then effect your object, so you start to plan accordingly. I guess the Swarm has had the most site specific installations and I have been doing that for the past 14 months. IOtA: How long have you been exhibiting your art? What's that experience been like? TL: In the year after my Senior art show in the List Gallery, I had 3 solo shows and one other large show with two other artists. I am in 4 shows this fall, and am exploring opportunities for 2014. For me it has been a very positive experience. For all the shows I got, there were 4-6 I did not get, but those are just the numbers and you need to push past just thinking about the odds. I just apply apply apply all the time, all over America. Once you have had a show it becomes a stepping stone to something larger, and I am just trying to keep my momentum as I focus more on showing here on the East coast. TL: Most of the challenges I face are ones I set for myself to keep me moving and adapting what I do. Each new piece is a kind of challenge or puzzle for me to solve. TL: There isn't one moment that jumps out right now. I'm reserving the distinction of 'most exciting' for when I get my first big fellowship or museum show, and that may take some time. IOtA: What projects are you working on now? TL: I am preparing for a show called "Artprize" which takes place in Grand Rapids, Michigan in September and October. I am showing at a gallery downtown and plan to cover a 6ft. diameter sphere with 2,000 of my cyanotype butterflies. I have some 520 more to finish before the 12th of September. 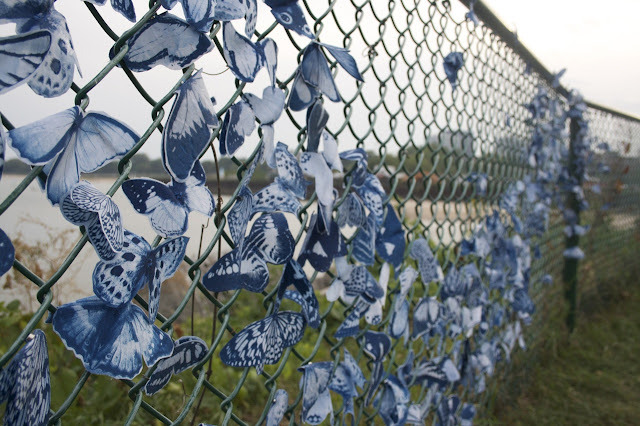 I am also working on a stop-motion animation that chronicles the swarm as my magnetic butterflies explore NYC. I am working with a fellow Swattie Amy Vachal '11— she wrote a beautiful song that I am using to set the tone of the animation. That should be finished before Artprize as well. I am also making a life-sized humpback whale in my studio in Newark. He is descending into the floor of the space and all you can see are the flukes. IOtA: Where is your dream exhibition site? TL: I'd never really thought about that. I would love to show all over the world though— it would be a great excuse to travel. TL: I hope that people smile, or think about something differently. I'd love for people to try making a cyanotype photograph, or reconnecting with sewing by hand, but I don't expect anyone to.